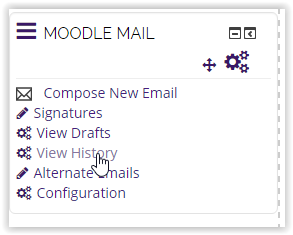 If an instructor sends Moodle Mail, he/she can view the history within the Moodle Mail block. NOTE: If a student claims they have not received an email, they may need to check their Spam or Junk folders. 2. In the Moodle Mail block, select View History. 3. You should be directed to the Moodle Mail History window. Clicking on the magnifying glass will open email and will display the message and the recipient list. If the Status says that all messages sent successfully, nothing more needs to be done. If a student claims they did not receive an email, have the student check the Spam and Junk folders of their email provides, as many students have their LSUMail forwarded. If the Status says that the email failed to send, check the recipient list and try to Send again.